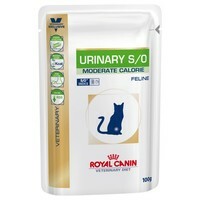 Royal Canin Urinary S/O Moderate Calorie Pouches for Cats is a nutritionally complete vet diet for overweight, neutered or inactive cats, to help treat kidney stones and bladder problems. Made with a reduced fat recipe with a low-calorie content to help limit weight gain, Royal Canin Urinary Veterinary Diet has been designed to help with the dissolution of struvite uroliths and to increase the acidic pH value of your cat’s urine. Royal Canin Urinary has also been carefully formulated to reduce the risk of recurrent struvite and calcium oxalate urolithiasis. Our ginger tom had urinary problems, basically one day I discovered he just could not urinate. Visit to the vet diagnosed struvite crystals in his bladder. Our vet recommended this product in both its wet and dry form. He seems to thrive on it, although it does tend to make your cat put on weight, hence the moderate calorie option. A rather expensive diet, but will save a fortune in vets fees. Subsequent urine analysis after the past 12 months had proven this products benefits.Have given it 4 stars because I feel these vetinary diets are overpriced by the manufacturers. My cat loves this food and does well on it. I am concious of the tendency for weight gain with this urinary diet so the moderated calorie content is helpful. Very palatable and no problems for my boy since he's been on the diet.